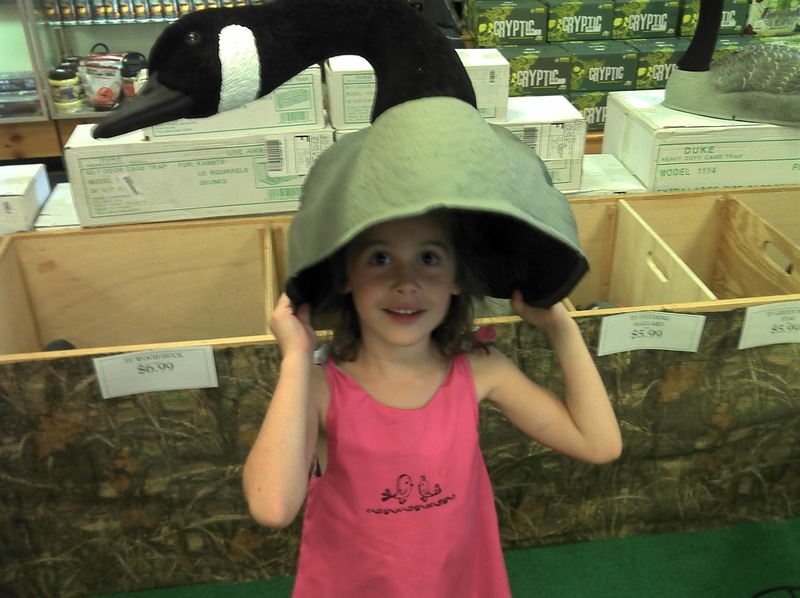 Took Lilly out with me yesterday to French Creek Outfitters in Phoenixville, PA. It's about a 10 or 15 minute ride from the house on a typical weekend day. While it's not a true "fly shop" it does have a very nice selection of fishing equipment, and a really good mix of fly fishing & tying gear. French Creek would probably be considered my local fly shop, as while I do live in the retail mecca of Limerick, there are no fly shops anywhere close to me. 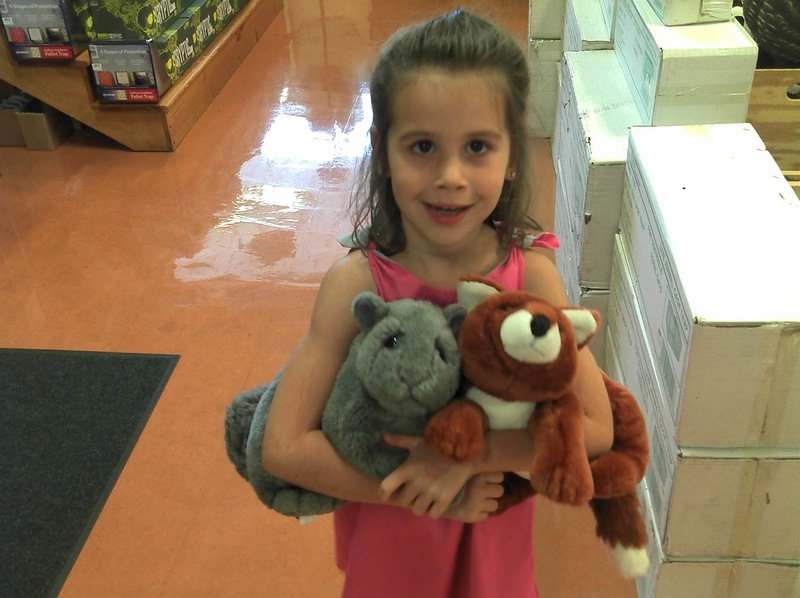 Lilly likes going to French Creek because once you toss in all the camping, hunting, and boating stuff too, there's a lot of loose ends for a 5 year old to get into trouble with. And I figured taking her would be better than her sitting at home playing Nintendo Wii. The duck & goose decoys were out on display. Lilly shows off her new headwear. I won't post the pic of Lilly running around with the pink semi-automatic...well...because her mother would kill me. 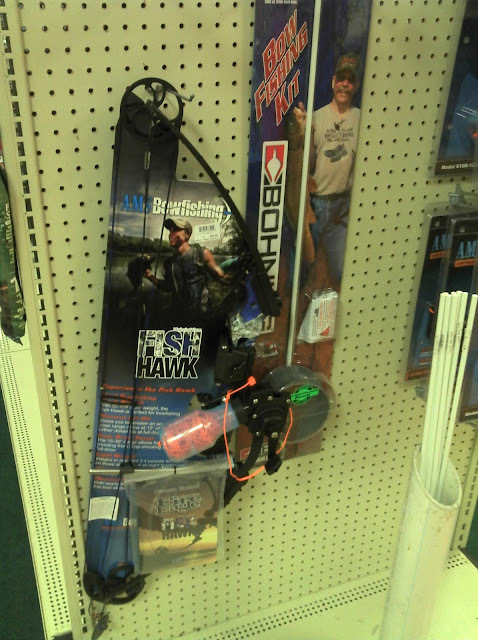 Oh, and last but not least while chasing her through the archery section (I don't hunt so I never really pass through), I stumbled upon a small bowfishing display. Who knew...I guess redneckery knows no bounds. Sorry no fly fishing section pics...maybe next time. Young Lady !!! SUPER girl and foto !!! Lilly looks quite at home in the wilds..... indoor wilds anyway. It's good to see your support of the lacals. Maybe you should let Lilly borrow the wallet next time...I think that she is ready!! Lol. Does she know how to sign your name on a credit card receipt yet? The bowfishing gear is a lot more sophisticated than the fibreglass long bow I used as a kid. I didn't even have a string on the arrow. 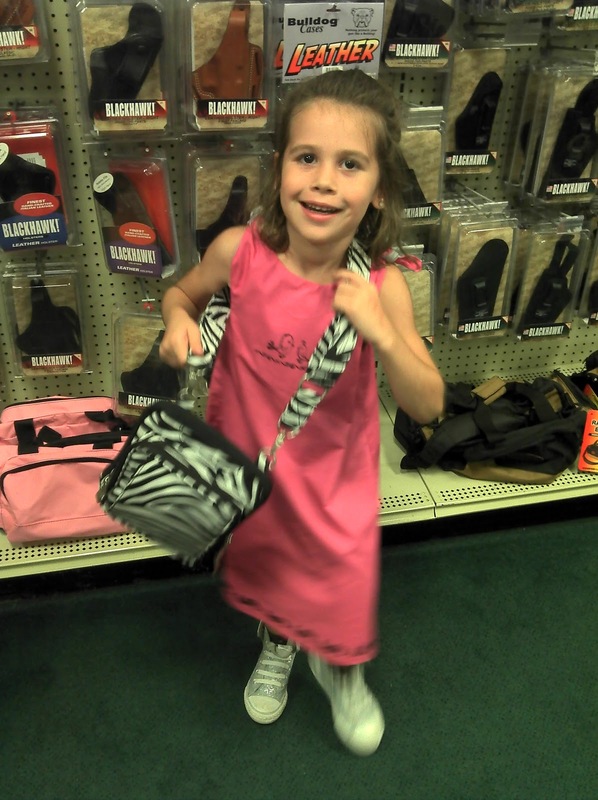 And taking Lilly to a sporting goods store with you, you are such a great Dad. Soon to be a very poor Dad, monetarily speaking. Is it worth a 45-60 min drive to check out the tying stuff? I gotta check this one out soon. I'm horrible at supporting the local small shops. Definitely try to support local business where I can. 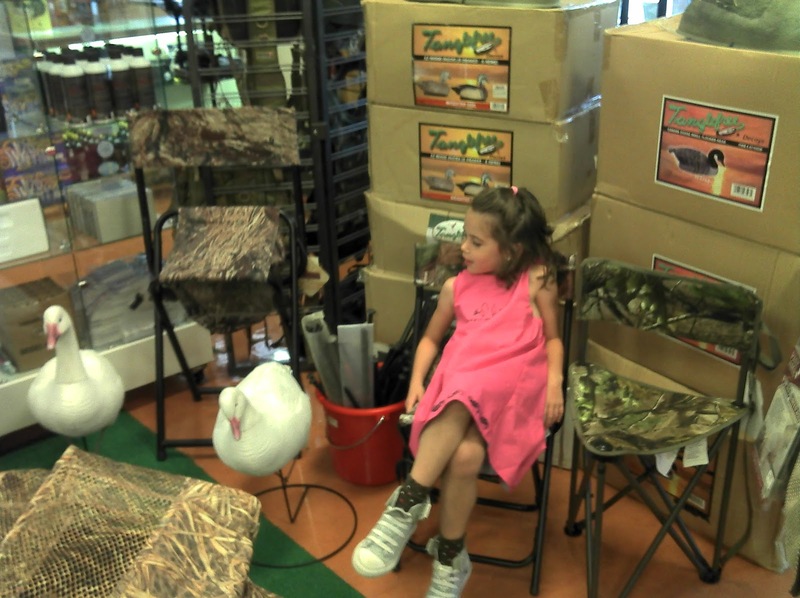 Lilly's my partner in crime, so she's quite accustomed to outdoors stores. If she did, she wouldn't be a French Creek...I think her preference would be Build-A-Bear. Bowfishing is foreign to me, and I'd prefer not to learn the language. Was pretty surprised to find it in the store though. If you've got a good local option, probably not. But if you're in the area anyway, it's a nice medium sized store.